Cliff's first opened over 90 years ago by Cliff Schneeman. He ran the business, with the help of manager Harry Finley, until 1969. Back then Cliff's stocked farm supplies, records, and everything needed for the time. In 1969, Ben Wickemeier purchased the store from Cliff with the understanding that Harry would stay and continue to manage the company. Ben owned Cliff's and was helped by his sons' Rick and Ben. When Harry retired in the '80s Rick became the floor manager. Ben Sr. decided to leave the business in the '90s, so Rick and Ben took over the company. 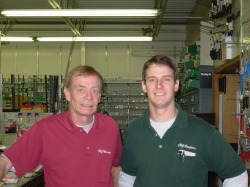 Rick ran the sales floor, while Ben performed the accounting duties. Ben retired in 2007, at which time Rick Wickemeier became sole owner. Currently, Rick's son Eli helps manage the business. Cliff Hardware is truly a family operated business. Andy Wickemeier, Jessi Wickemeier, Jackie Durham, and Jim Durham are just a few of the other family members who have worked at the store over the years. And our employees might as well be family.